What’s up, y’all?! I just finished my lengthy recounting of my Korean Thanksgiving abroad in Hong Kong, Macau, and Taiwan, so now I’m bringing it back to the Korean peninsula in Hongdae a.k.a. one of my favorite stomping grounds in Seoul. It’s the local university neighborhood, so naturally it’s filled with young people my age compared to the ajummas scowling outside my apartment and the ajeossis getting drunk and visiting the love motels in my backyard. This age difference leads me to frequent this happening student quarter, and along the way I manage to try all of the funky restaurants that cater to the young, restless, and hungry. Today I’ll be talking about Burger Bay. It’s located at Mapo-gu Seogyo-dong 362-7 Seoul South Korea. It was actually quite an impromptu visit since I had originally just planned on meeting up with my friend Heidi to pick up my shipment of Sriracha hot sauce from the States. Don’t judge me. Korea lacks legitimately spicy sauces for everyday use. After meeting up, we decided to grab dinner and catch up on our vacations abroad. We ended up at Burger B because I had seen it many times during nights out and wanted to see the overall quality of the burgers they made. 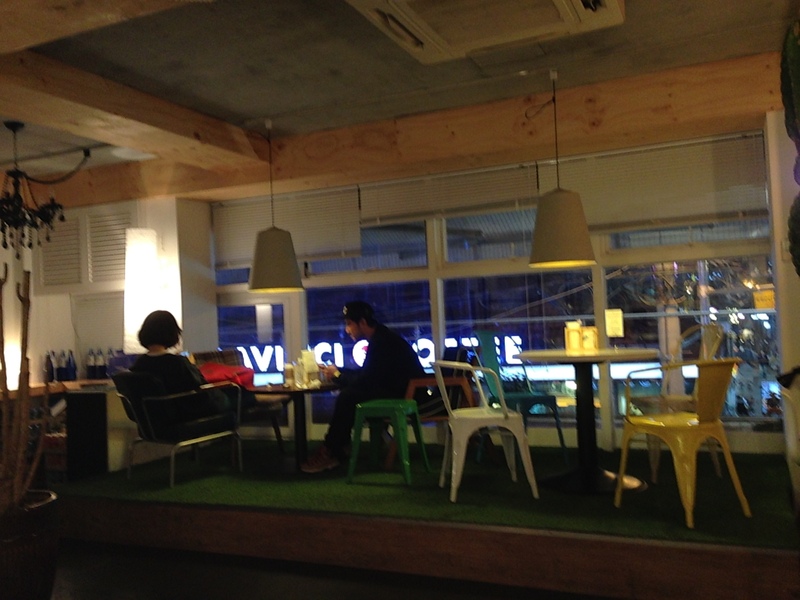 So we walked into a very nicely decorated and arranged restaurant with no foreigners inside which was interesting for Hongdae since there are normally a lot of foreigners in the burger joints. We sat down to look at the menu, and the waitress recommended the regular size for two people (read: Korean people or anyone else who isn’t used to American sized portions). Heidi just went with a regular cheeseburger while I went for the regular sized Bay Burger. After a good amount of time talking about Korea and how it compared to the States/my Chinese adventures, our burgers emerged from the kitchen. They were a sight behold. I never saw a burger that larger ever in Korea. It was like I was back home, but the size was more intimidating because the bun was quite thick which was a bad meat to bread ratio. On the side we got a small portion of golden steak fries that were delicious and lightly drizzled with a garlic aioli. The jalapenos that came with it were also a big surprise since you rarely see them in Korea, but they were largely tasteless since they took away most of the spicy seeds. The burgers, however, were the main talking point of this meal, naturally. 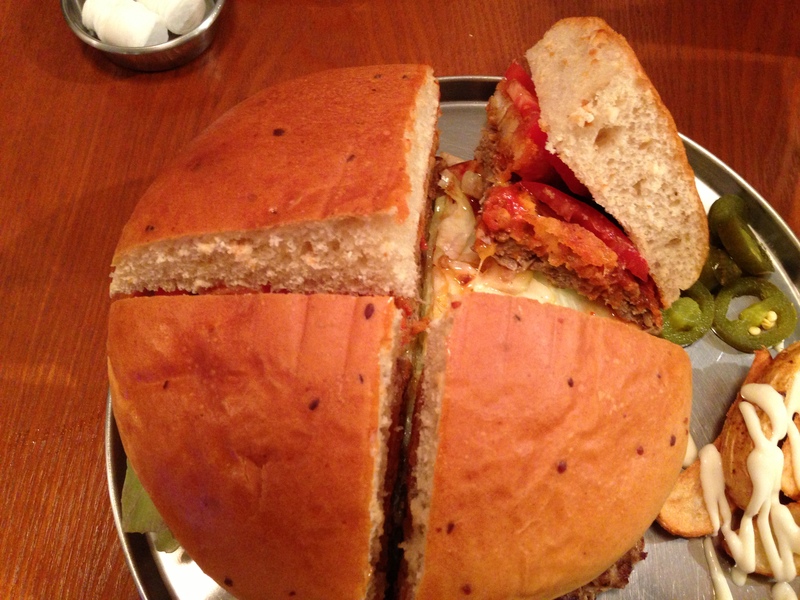 On mine, there was marinara sauce, hashbrowns, tomatoes, lettuce, and a thick juicy beef patty. I didn’t really understand why there were hashbrowns and marinara sauce on the burger, and it didn’t make the burger that delicious. It did make me think of the Korean propensity to always combine tomato based products with some form of potato like throwing potatoes on every form of pizza known to mankind. I was somewhat pleased with my burger but not blown away. Then there was Heidi’s burger. 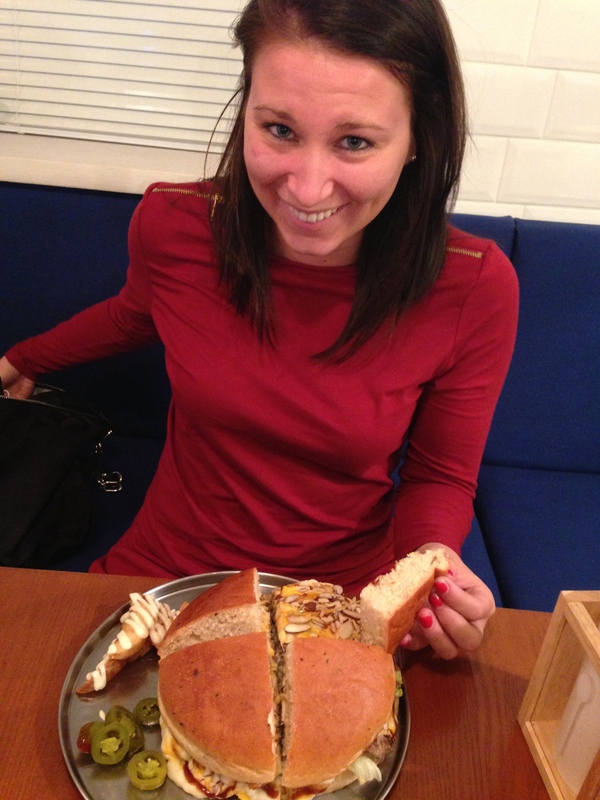 Heidi’s face sums up our feelings about this “cheeseburger”. Normally, a cheeseburger is just what it says it is. Cheese+burger, but this was no ordinary burger. When she lifted the bun, she found chopped almonds coating the cheese like a brown and white blanket of snow. Why, Korea? I tried a bite, and it was somewhat disgusting because the nuts were semi-sweet for some reason. I don’t know how she ate 3/4ths of her burger but more power to her. I’d say check out Burger Bay if you’re looking for a chill place that has an interesting mix of ingredients on burgers, but I’d recommend looking elsewhere for the best burger in Seoul. Posted in American Cuisine, Burgers and tagged almonds, bread, Burger, cheese, hash browns, jalapenos, marinara, sauce. Bookmark the permalink. 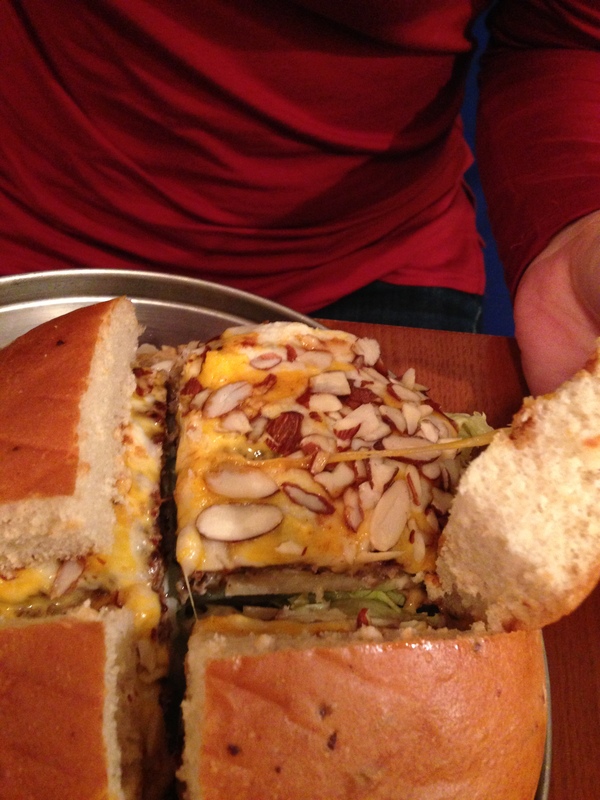 Almonds on a burger man.. that looks interesting. I’m not too big fan of a bun that big, did you find that it took away from the rest of the ingredients?? I think the bun did take away a bit from the ingredients since it felt like I was eating more bread than burger. Plus, I had to unhinge my jaws to take a bite which is never a good look unless I was on a snake National Geographic special.